I’ll soon be attending another icon workshop with the Prospon School and I wanted to bring along a couple of tools I had made for the last workshop I attended. But, they were much too large both for what I needed and for being able to pack into a suitcase. A mahlstick is a device that painters, icon writers and sign letterers use to steady their hand. It is sort of like a drumstick with leather wrapped around the tip that you can rest on a surface (including the canvas) and be assured that it will not slip. They can be made in any size to suite the work. 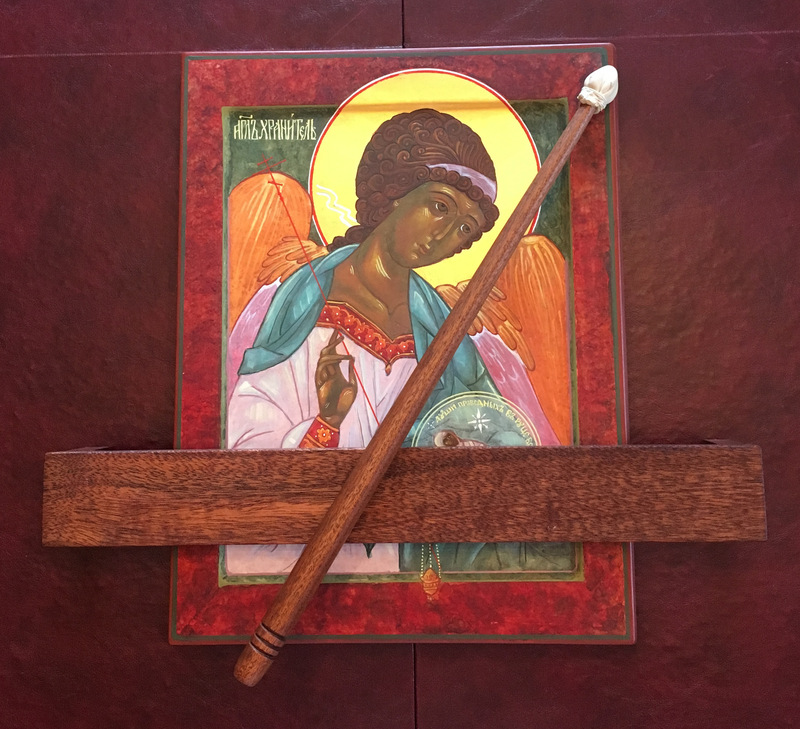 A painter’s arm wrest is a simple board with feet that is large enough to place over the icon (or canvas) laying on a table where you can rest your arm. Used in conjunction with the mahlstick it provides much needed support when doing detailed work. Here is my latest ‘interpretation’ of these instruments. Sure, you can buy a mahlstick at Blick Art Supply for around $25, but where’s the fun in that when, if you’re lucky enough to have a workshop, you can go into the shop and dig through the scrap pile and make them for virtually nothing. I had plenty of mahogany scraps and some leather from previous craft projects. I turned the stick with a taper much like a drum stick and put adhesive rubber feet on the bottom of the arm rest so it won’t move. Both the arm rest (board) and the mahlstick are approximately 14.5″ long. You could also simply use a dowel and put a tip on it, or an old drumstick, the possibilities are endless! The arm rest fits over the icon with enough clearance not to touch and the mahl can rest on the icon or on the work surface.